I'm trying to get a highly recommended natural balance trimmer out. He's 3x's the normal price.... I think we have a farrier here who does it? What is the general consensus? I am fairly sure that I remember Heather's gelding not benefiting, but it's worth a shot? i have viedos on the shoe and the guy that created it, i think in some situations it is useful, and some situations unneeded, and in others not helpful.... just depends. my horse just plain can do good in shoes period, he needs to be re-set to often to be of use or for me to afford it. it would need to be reset every 3 weeks. Well I got a different, but also highly recommended farrier. He said that Cyn's clubfoot was minor, (1 on a scale of 1-5)but he worried if he took too much heel, that it would strain his tendons on the back from heel to knee....It makes logical sense, but I don't know enough! Do we correct one issue and cause another? PS, this farrier talked so much about structure that I think I've been seriously neglected in the past. He advised that the crack in Serenity's hoof (that she's had forever) was probably yeast infection and exposed it to air, also injected a little mercury and iodine up in the dead white line area. Ever heard of that? Any farrier worth his salt can give a good barefoot trim. I wouldn't pay 3x the price for "natural balance". No, it was a more average to low price. $30 per horse. My old cushingoid pony who liked to mildly founder every year or so grew in his hoof wall exactly like the thick toe of the natural balance shoe. I never could figure out how he managed to produce that thick of a wall along his toe. I think that one would be because the wall actually wasn't growing straight, it kind of scrunches up and grows thicker instead of longer downward. I would think it had rings as well? The way the wall would grow longer in a normal hoof is by the lamallae disconnecting and reconnecting as the wall moves down and some horn is added, in a laminitic horse that isn't working properly and thats where you get the rings and thickened walls, the wall coming from the top gets a bit stuck or slowed down but hoof is still coming in from the hairline and needs a place to go. You just have to stop the damage (whatever the cause was) so everything heals up and it can get back to normal working order. Each ring is a disruption to an extent even in a non laminitic horse and hooves with a lot of rings will appear to "grow slowly" or "grow more heel than toe". Here is a pic from right before a trimming and awhile after a founder episode. I think part of the reason why he recovered quickly from any founder type episode was because his hooves grew incredibly fast. We had to have them trimmed every 2-3 weeks at the most. Looks good! beautiful example pic too. The major bump is from the big attack, wall all around basically just stopped growing down normally for a short time. 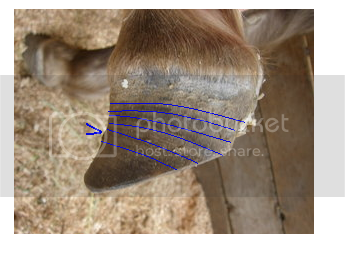 then it started moving again but the toe area couldn't grow down normally yet so you have the rings further apart on the heel, most drastic in that first section after the attack, then they gradually even out and the hoof is growing normally. My lines are really roughly placed but you get the idea lol. and so those scrunchy areas of wall on the toe are can be a bit thicker than normal. Thanks Morgan! I wish I had taken a photo of the bottom of the foot, but I was taking a pic to get a good example of an obviously founder foot. Thats the best example I have seen to explain founder rings - thanks !